Less than three months into the job, Tennessee Education Commissioner Penny Schwinn has filled six of her nine cabinet positions with a mix of new hires, retentions, and promotions as she begins to restructure one of the state’s highest-profile departments. Schwinn, who took the helm of the 600-employee education department in early February, said she wants to have her entire team of top advisers in place by July 1, the start of a new fiscal and school year. For her chief of staff, Schwinn has picked Rebecca Shah, who worked at the Texas Education Agency where Schwinn served as deputy commissioner of academics before Gov. Bill Lee hired her to be Tennessee education chief. “She ran performance management for me in Texas, so she really knows what I’m looking for in terms of data collection and holding us internally accountable,” Schwinn said of Shah. Her deputy commissioner will be Amity Schuyler, soon departing as the superintendent’s chief of staff in Palm Beach County, Florida, the nation’s 10th largest school district. Schwinn is still hunting for a chief district officer and an assistant commissioner of communications and engagement. But atop her list of vacancies to fill is chief academic officer. The jobs are among a dozen high-level openings listed on the state’s website, including assistant commissioner of school improvement. Sharon Griffin, hired last year to run the state’s highest-profile school turnaround program, will keep that role at the Achievement School District, Schwinn told Chalkbeat this week. However, under a revised chain of command, Griffin will report directly to a new chief schools officer instead of to the commissioner, as she had under Candice McQueen, Schwinn’s predecessor. While reorganizing is common for a new commissioner, Schwinn’s hires thus far show she is leaning on some experience and institutional knowledge from within Tennessee’s education department while also recruiting a few key outsiders. Retained from McQueen’s cabinet are Christy Ballard, the department’s general counsel, and Assistant Commissioner Elizabeth Fiveash, who oversees legislative affairs and policy and maintains a daily presence on Capitol Hill when the General Assembly is in session. Promoted from within are Eve Carney, who as chief schools officer will oversee school improvement initiatives including the Achievement School District; and Sam Pearcy, who as chief operating officer will look after finance, information technology, procurement, and school services. Carney joined the department in 2008 and previously administered federal grants programs. Pearcy, who has been with the department since 2013, has focused most recently on improving state efficiency to support school districts. Schwinn said her new organizational chart, which is slated to go into effect on May 1, was developed with feedback from district superintendents. The restructuring shrinks the commissioner’s cabinet-level advisers from 11 to nine and also scales down the number of people reporting directly to Schwinn. Below is the organizational chart from last fall, before the change in administrations. The arrivals under Schwinn coincide with some high-level departures. McQueen’s chief of staff, Laura Encalade, left along with former communications director Sara Gast to work for their former boss in McQueen’s new role as CEO of the National Institute for Excellence in Teaching, a nonprofit organization focused on attracting, developing, and keeping high-quality educators. Chief Financial Officer Chis Foley was dismissed by Schwinn. Others, like former deputy commissioner Kathleen Airhart and former chief academic officer Vicki Kirk, accepted other jobs before the change in administrations. Lyle Ailshie, who as deputy commissioner stepped in as the department’s interim leader before Schwinn started, is expected to retire mid-year and return to East Tennessee, where the state’s 2005 Superintendent of the Year oversaw districts in Kingsport and Greeneville. Meanwhile, Schwinn has moved her family to Tennessee after commuting on weekends to Austin during her first months on the job. The oldest of her two daughters is a student in Metropolitan Nashville Public Schools. Amy Christie has seen it many times. A student gets into a great college and heads to admitted students’ weekend, excited to explore their academic future. Then they start examining financial aid packages — and the numbers just don’t add up. The result: Instead of enrolling at that school, the student ends up somewhere less expensive and less selective. Researchers call the phenomenon of enrolling in a college that doesn’t line up with academic skills “undermatching,” and it’s more common among students from low-income families. Achievement First, which operates 36 schools across three states, is about to try a new way of addressing the problem. The network’s Brooklyn board approved a plan last week to offer scholarships to students who opt to attend a more expensive school with a higher graduation rate for black and Hispanic students. “We believe that fairly modest amounts of scholarship money (~$3,000-$7,500/year) could have a significant impact on the matriculation decisions that a subset of our scholars and families make,” the proposal says. It’s the latest attempt by a charter network serving mostly students of color from low-income families to help their graduates make it all the way through college — something that the schools acknowledge is a challenge. One reason is the financial burden college can put on students and their families. “What our counselors are saying is that sometimes it really is just a modest amount of money,” Achievement First CEO Dacia Toll told board members. Here’s how the scholarship will work: To be eligible, a high school senior must be choosing among colleges, including one that is more expensive but has a substantially higher graduation rate among black and Hispanic students. Students would be selected based on their financial need, academic track record, and other qualities like motivation. Roughly 20 students who graduate this year from one of its Brooklyn high schools would be eligible for an average scholarship of $5,000 each year of college. The charter’s board approved allocating $100,000 annually for the program, money that will come from general funds the network receives from the state of New York. If the program proves successful, Achievement First hopes to expand it, perhaps by raising philanthropic funds. “I think it’s really interesting,” said Matt Chingos, the vice president of education data and policy at the Urban Institute who has studied undermatching. He said he hadn’t seen scholarship programs as specifically targeted as Achievement First’s. There is evidence in a number of states — Michigan, Florida, and Wisconsin — that need-based scholarships increase the chances that low-income students will enter college and earn a degree. There’s also research, consistent with Achievement First’s approach, suggesting students benefit from attending a more selective, better resourced school. “People are more likely to graduate from places where more people graduate,” Chingos said. Two studies in New Mexico and Tennessee do offer a note of caution, though, suggesting that scholarships may not end up helping lower-achieving students complete college. But even in these studies, relatively high-achieving students do benefit. This scholarship won’t directly help college students with unexpected costs or living expenses. A 2016 KIPP survey of its alumni found that 43 percent reported missing meals while in college for financial reasons. Achievement First also maintains an emergency fund of $67,000, according to a spokesperson, which between 12 and 24 alumni tap into annually. KIPP recently expanded a similar program it started in Washington D.C. in 2014, with four of its regions starting their own funds with about $40,000. Christie hopes the extra funding could help reduce the anxiety of students who do opt for schools that might put financial strain on their families. “When there has been a student who actually has chosen the more expensive institution for all the right reasons, and the family hunkers down and says, ‘OK, we’re really going to make this work,’ but it’s at a level of stress — there’s this sentiment of living semester by semester or just being kind of on edge a little bit because you know that bill is coming,” she said. Pellissippi State Community College and Cumberland University saw higher enrollment and degree completion since Tennessee Promise was launched four years ago, according to a new study. Tennessee Promise is a last-dollar scholarship and mentoring program that gives high school graduates five consecutive semesters of free tuition at an eligible Tennessee community or technical college. The program was launched in fall 2015. The reports, done by the University of Tennessee-Knoxville’s Postsecondary Education Research Center, are the first two in a series of reports that are looking at the impact of Tennessee Promise at specific higher education institutions in Tennessee. Interim President Randy Boyd, who previously served as Gov. Bill Haslam’s adviser for higher education and helped create the Tennessee Promise program, said the program has helped to change how Tennesseans think about education. Pellissippi State Community College, the largest community college in Tennessee, had a 25% increase in first-time, full-time freshman enrollment during the first semester of Tennessee Promise. Additionally, first-time, full-time freshman enrollment had increased by 40% by the fall 2018 semester. “The study shows that Tennessee Promise both increases accessibility to college and provides incentive for more students to stay the course. At Pellissippi State we are happy to play a role in helping a larger group of Tennesseans earn a post-secondary credential,” said PSCC interim Vice President of Academic Affairs Kathryn Byrd. Since Tennessee Promise launched, Pellissippi State also saw an increase in the number of African American and Hispanic students enrolled. The number of African American students grew from 5% in the fall 2015 freshman cohort to 6.4% in fall 2018. Hispanic student enrollment grew from 4.4% in the fall 2015 freshman cohort to 5.9% in fall 2018. In total, Pellissippi State had 10,894 students enrolled for the fall 2018 semester. At Cumberland University, a private university in Lebanon, Tennessee, the number of students enrolled in Tennessee Promise grew from 68 in 2015, when the program started, to 414 in the fall of 2018. Cumberland University has 2,405 students enrolled, according to the school’s website. “Among the first cohort of Tennessee Promise students at Cumberland University, 44.9 percent completed their associate’s degree in the first five semesters, compared to 23.6 percent across the state,” according to a news release from UT. Cumberland University President Paul Stumb said the school’s focus on retention has helped drive students to complete their degrees, including a free tutoring program and student retention center. “Our faculty and staff are devoted to keeping these students in school and getting them to the goal,” Stumb said. Cumberland University also retained a higher percentage of Tennessee Promise students each semester than statewide averages. Like at Pellissippi State Community College, the number of minority students at Cumberland University also increased under Tennessee Promise. Enrollment of Hispanic students grew from 1.5% to 5.6%, African American students grew from 4.4% to 5.1%, and Native American and Asian student enrollment grew from less than 1% each to 1.7% and 1.2%, respectively. The study also found that students enrolled in Tennessee Promise take more credit hours in their first semester and are more likely to complete their degree or certificate than students not enrolled in the program. In the first group of first-time, full-time students, 23% completed their program in five semesters. Of students not enrolled in Tennessee Promise, 7.6% completed their program in the same time period. Students in the first Tennessee Promise cohort had a three-year completion rate of 30.1%, whereas the year before the program started, the three-year completion rate was 23.5%. Last month, UT announced it will launch a last-dollar scholarship program similar to Tennessee Promise that will allow students to attend a UT school free of tuition and fees. The program, called UT Promise, will launch in fall 2020 and will cover tuition and fees for Tennessee high school graduates with a household income of less than $50,000 a year and who are recipients of the state’s HOPE scholarship. UT Promise will be available for undergraduate programs at the UT Knoxville, Chattanooga or Martin campuses. For several years, the education world has been worried about the decline in the number of students interested in becoming a teacher. 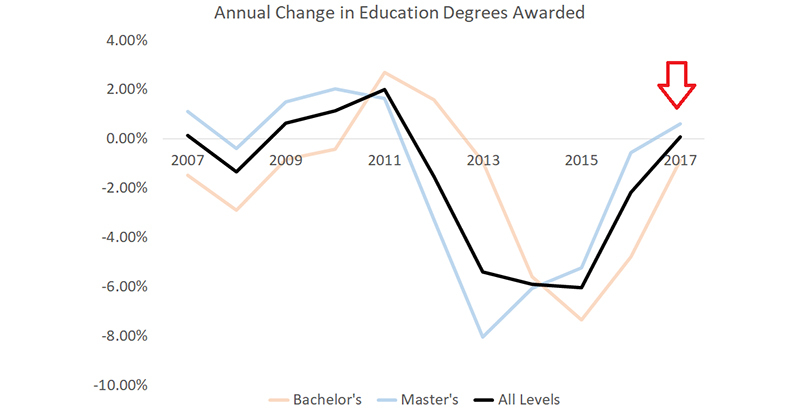 In the wake of the Great Recession, the number of students pursuing education degrees and earning their teaching licenses began to plummet, and the declines were particularly severe in certain states. But was this crisis mainly due to policy decisions in the education sector, or more a function of underlying economic conditions? I’ve long been on team economics. In support, I’ve pointed to a 2015 study showing that college students made their decisions about what major to pursue based on prevailing economic conditions. In fact, that study found that the number of students pursuing education degrees was more susceptible to labor market trends than any other field of study. When recessions have hit the American economy over the past 50 years, both men and women were less likely to want to become teachers and instead turned to fields like accounting and engineering. The economy has improved markedly over the past few years, so according to the economic explanation, we should start to see more young people pursuing a teaching career. Is that happening? My tentative answer is yes. We’re starting to see preliminary signs that the supply of new teachers is beginning to grow again. According to a reportissued in April, California has seen four consecutive years of increases for initial teaching credentials. And, while it made national headlines when Teach for America, the country’s largest provider of new educators, saw its applicant pool fall significantly from 2013-16, its subsequent rebound has happened much more quietly. National data are starting to confirm these anecdotes. The most recent national statistics we have on new teacher licensures come from 2015-16, but we now have provisional data from the Integrated Postsecondary Education Data System on college completions for the 2016-17 school year. Those numbers show a promising trend. 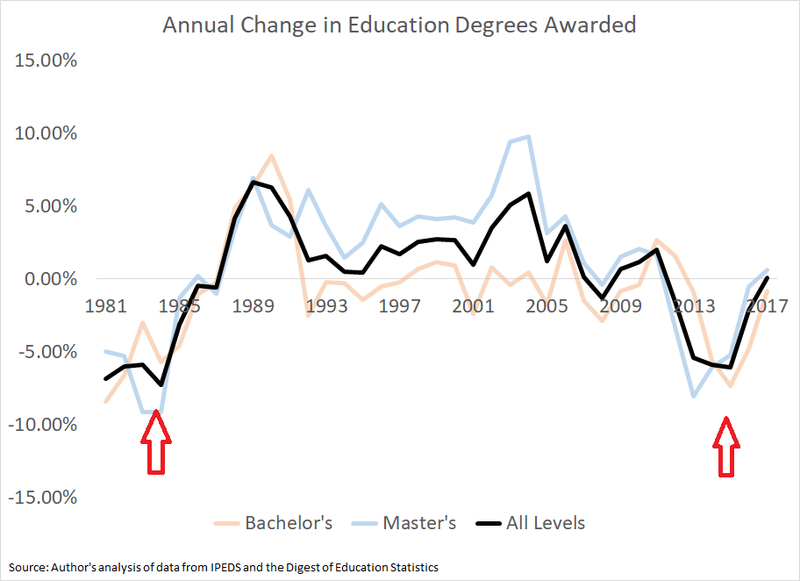 After bottoming out in 2013, the year-over-year changes in the number of students completing an education degree got smaller and smaller. 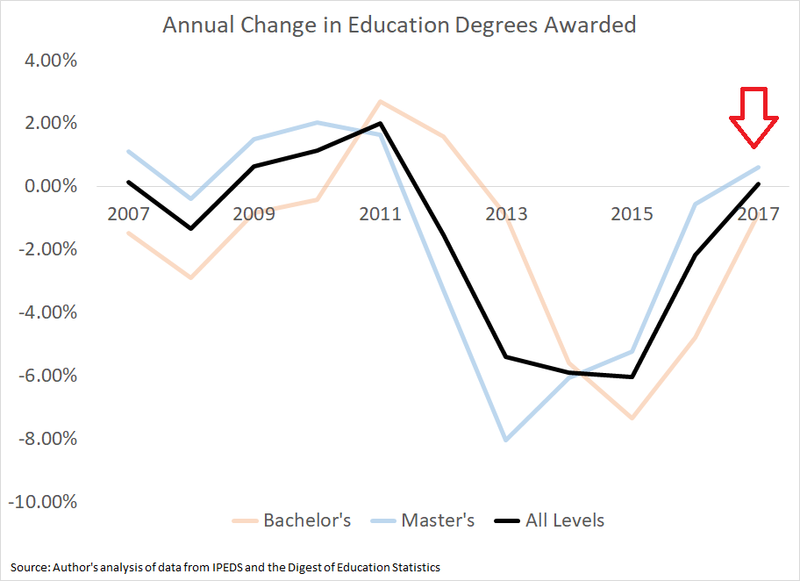 And in 2017, the most recent year for which we have data, we had the first year-over-year increase in college graduates with education degrees since 2012. It’s still not much — 2017 was just .62 percent higher than 2016 — but it could be the start of a promising trend. It has been a while, but this story has played out in American schools before. In the early 1980s, the number of young people graduating with education degrees was declining by 5 to 9 percent year-over-year. But things started to look less bad by 1986, and then we had 20 straight years of gains from 1988 through 2007. These trends also match up with survey results about whether parents would want their children to become teachers. Just like the number of education degrees, answers to that question bottomed out in the early 1980s, rebounded in the late 1980s and remained high throughout most of the 1990s and early 2000s. Although those survey results hit a new low last year, the increase in the number of college students pursuing education degrees may portend another rise in the perceptions of parents. Now, I’m not saying we’re likely to see the same stretch of gains in terms of perceptions or results we saw in the 1990s and early 2000s. That would depend on lots of other factors, including the number of college-age students and future economic conditions. Nor am I saying the teacher labor market is perfectly balanced today. Even if the supply of new teacher candidates is starting to improve, it still may not match the growing demand for new educators. And as Kaitlin Pennington McVey and Justin Trinidad noted in a report for Bellwether Education Partners in January, some subject areas are chronically short of high-quality teacher candidates regardless of the underlying market conditions. But these green shoots are an early indication that the teacher labor market may be starting to thaw. We’ll have to wait for more data to confirm these preliminary findings, but there’s reason to be hopeful that we’re on a positive trajectory. Nashville is the latest city to copy pieces of the Memphis Lift model. Carpenter said she’s been meeting with parents in Oakland and Atlanta to help get their programs started. An Indianapolis nonprofit launched an advocacy fellowship earlier this year to give low-income families and families of color more voice in their local schools – and pointed to Memphis Lift as one of the model examples of parent engagement work. The Memphis fellowship has trained 327 members, mostly women, since it launchedin 2015 on how to navigate an increasingly complex school choice system and how to understand state data on schools. This past year, Memphis Lift offered training for Spanish-speaking parents and is working to create its first all-male cohort for fathers and grandfathers. PHOTO: Nashville PropelOn March 9, members of the Nashville Propel joined together to officially launch their group.